Ok, no need to double check your calendars, it's Thursday, but it starts with a T so lets just pretend we are on the right day ok? No worries though, next week we'll get back on track with our tub base Tuesday posts. This one was just too pretty to wait. While reading La Dolce Vita, one of my fav blogs, I couldn't stop Ooooing and Ahhing over a house by Jeffrey Alan Marks. The artwork was so fab and the decor with it's rich jewel tones and gorgeous furnishings left me wanting to go furniture shopping, not that it takes much to get me to want to go furniture shopping, but I digress. Then I saw this simple bathroom photo. Everything is so clean and elegant, it's perfection in it's simplicity. Less is often more, and in this case less is oh so much more. 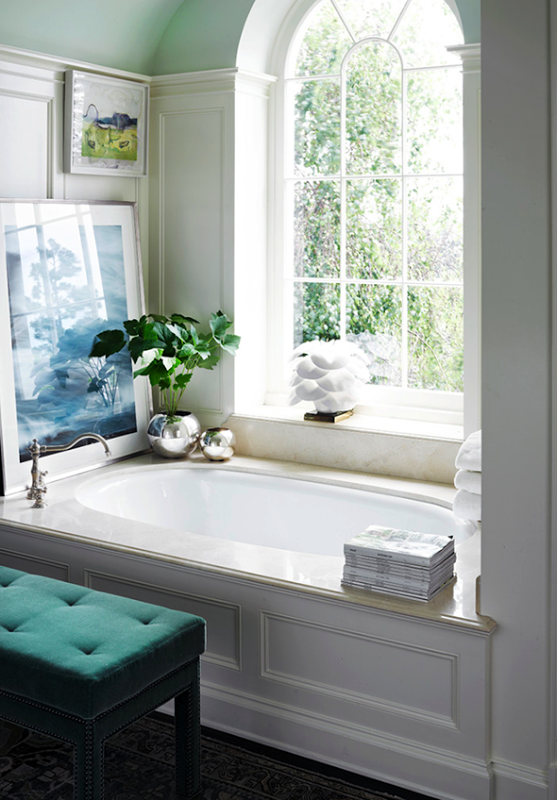 The hints of mint and green and the splash of blue add just the right touch of colour to give this tub area a fresh feel. The large, gorgeous picture window doesn't hurt either. You know how I love under mount tubs and this oval princess is no exception. Besides that stack of magazines all I'd need is a bottle of bubble bath, a tall icy drink and it would be the perfect end to this Tuesday, I mean Thursday night. I think this photo is a great inspiration and starting point for a pretty bathroom design.